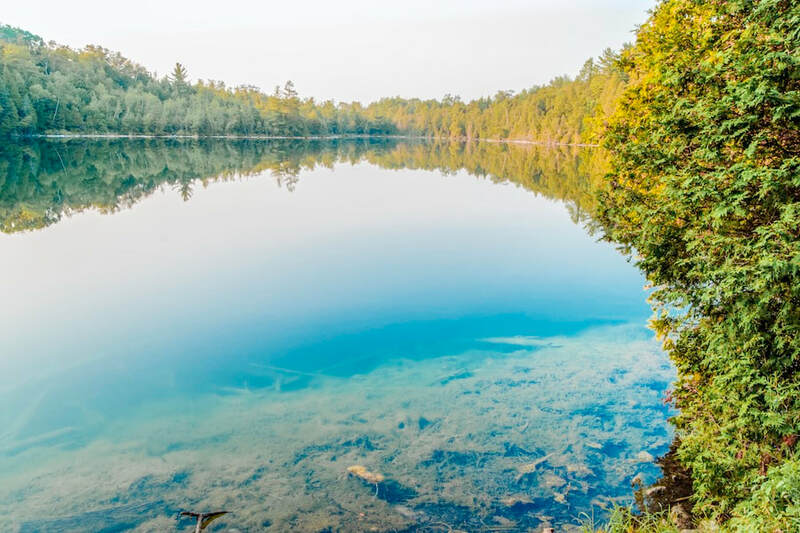 Geological tour to Rockwood Conservation Area and to Crawford Lake Conservation Area, includes bus, group entrance fees, and a picnic lunch for $36 per person. Visit local relics of the last ice age. Bus tour for those not staying for the Symposium, leaving from the Arboretum, returning at 3:15 pm in time to meet delegates at the close of the symposium. Accessible for those with mobility challenges. Guided by Dr. Alan Morgan geology professor emeritus, University of Waterloo. Dr Morgan will interpret some ice age features that lie within thirty minutes of the Guelph Arboretum. As residents of Southern Ontario we are surrounded by evidence of the great ice sheets that covered our province till 12,000 years ago. When the ice sheets began their retreat, the gentle Eramosa River that meanders through Guelph to where it joins the Speed, became a mighty torrent to rival Niagara River. 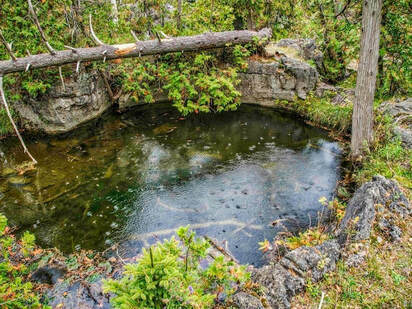 In the process it carved a chasm and a series of almost 200 near perfectly circular giant potholes many of which can be seen from the boardwalk in the park. The great weight of ice on the Niagara escarpment high above the Kelso ski slopes caused the collapse of rock over a cave system to create unique Crawford Lake, a remarkable 80 feet deep "meromictic" (meaning there is very little exchange between deep water and surface water) body of still, clear water that, in the undisturbed sediment at the bottom of the lake, bears silent witness to thousands of years of archaeology and early human settlement. The lake is surrounded by an easily accessible boardwalk. The interpretative centre, operated by Halton Hills Conservation Authority, includes evidence from sedimentary cores taken at the bottom of the lake. 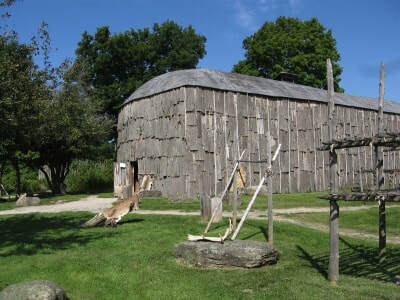 Also, there is a five-acre reconstructed First Nations village on the site where it stood near the lake 500 years ago. ​You are cordially invited to join members of Guelph’s Summer Lecture Club & Third Age Learning who plan to host Jim Sanders and his wife Anne to dinner at the Stone Crock Restaurant, King Street, St. Jacobs, and to the Drayton Theatre Company's revival of the acclaimed Tony Award winning play . . . Seating at the theatre is limited, so please respond soon. This invitation will be withdrawn once all theatre seats in our block reservation are taken. We have reserved the restaurant for 5.30 pm and a limited number of “group rate” seats in the theatre at 7.30 pm. Reduced, block price tickets for the theatre performance are $44 each, taxes included. Optional buffet dinner at 5.30 pm at the Stone Crock Restaurant, 1396, King Street N., St.Jacobs. Everyone is responsible for their own meal charges. It is about a 40 minute drive from Guelph to the restaurant, and about 10 minutes drive from the restaurant to the theatre. Carpooling can be arranged. And then, before departing for home, there’s Sunday Morning .. The tour will be provided by senior veterinary students, to give our guests a close perspective of the work of the veterinary college. The tour includes Health Science Centre, the Institute for Comparative Cancer investigation, and Hills Pet Nutrition Primary Healthcare Centre for animals large and small. So that there are adequate opportunities for questions, participants will be divided into small groups of 12 to 15 participants, each under the guidance of a veterinary student. Please register for this tour by April 5, 2019, so that we can advise the OVC of numbers to expect. Ranked seventh in the world, the OVC is the major college for the training of Doctors of Veterinary Medicine in Ontario. We are ranked 7th in the world, 4th in North America, and 1st in Canada! As well as Vet training, it is a major research facility, including research into human health conditions. The OVC is one of the founding colleges of the University of Guelph, a university consistently ranked as the top comprehensive university in Ontario and placed among the top three in Canada by Maclean's Magazine. One of five veterinary colleges in Canada, the Ontario Veterinary College is accredited by the American Veterinary Medical Association Council on Education (AVMA-COE) and holds the status of Full Accreditation. In the final year of the DVM program students write the North American Veterinary Licensing Examination. OVC grads can be licensed in most countries, giving them a spectrum of opportunities after they receive their degree. A national survey of university graduates rated the University of Guelph number one in all but one category, putting it at the top of the list of universities graduates would endorse. Guelph has many awards and accomplishments including having one of the lowest unemployments rates in Canada, Award for age friendly initiatives, Canadian Climate Change Award, on Culture Days' top 10 list three years in a row, ranked best place to buy real estate in Canada, etc. Guelph is a city rich with many walking and hiking trails. There are also several boutique shops in the downtown area. Street parking in downtown is free for the first 2 hours.